The Fitted Diaries: Pinot or Concord? Todays fitted of choice is that of the Jamestown Jammers. The Jammers are a Short-Season A baseball team in the New York-Penn League which play in the Pinckney Division. Prior to being known as the Jammers the franchise, which has been in existence since 1989, was known as the Niagra Falls Rapids. The Jammers are affiliated with the Florida Marlins of Major League Baseball and have been since the 2002 season. The franchise is located in Jamestown, New York and play at Russell Diethrick Park. Some notable alumni of the Jammers include Brandon Inge, Jeremy Hermida, Josh Johnson, and Jeff Weaver. 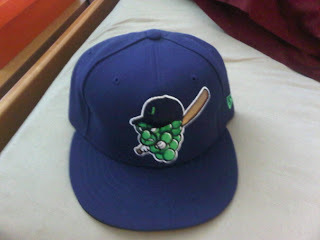 The Fitted has a deep purple crown and brim with a caricature of a bunch of green grapes. The Character has a cap on, a baseball bat, and a scowl on its face. Definitely a tough fitted, and one that will catch people looking when they pass by. This fitted can be found at http://www.mickeysplace.com and search Jammers. A rare fitted and a hard find, so if its not available don't be a sour grape about it.